Before we begin with the best iPhone Karaoke apps, it is important to understand what karaoke really is. Karaoke is a pretty popular source of entertainment across the world, which is famous as a video game originally developed in Japan. Nowadays, people tend to get most of their work done on their smartphones, and singing karaoke is no exception. If you have iPhone or iPad, Just simply download Karaoke apps your iPhone/iPad so that you can enjoy singing karaoke anywhere and anytime. With pure heart for singing, you may often search for the best Karaoke apps which will offer yourself great singing experience in the comfort of your home. For your convenience, here we listed the top 9 singing apps for iPhone or iPad. Tips: If you lost any music videos from your iPhone Karaoke Apps, you can try to use Gihosoft iPhone Data Recovery to get them back with/without backup. Smule is a trusted brand when it comes to developing music apps. Again, it allows you to fulfill your passion of singing alongside making friends around the world. With this, you can sing solo tracks and even duets, and you can also use effects and filters to edit your tracks. 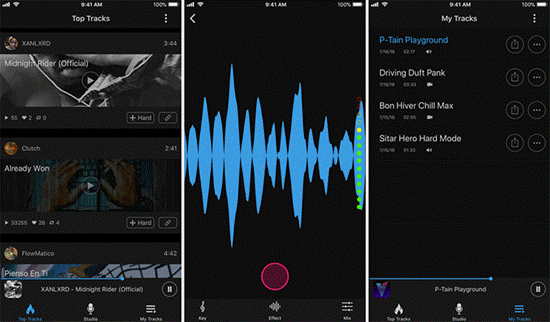 These types of features make this singing app stand out from others on iPhone. If you and your friends go live at the same time, you can sing and dance together on this karaoke app. You can tune your saved tracks by using the feature of pitch correction, then your tracks will sound smooth and professional. You can turn into a social media singer by using fantastic features from Smule. Another distinctive feature of the Smule app is that it records your singing score. You can try and beat your singing score again and again; and once you reach to a specific score, you will be crowned as a karaoke pro. This Karaoke app is one of the famous products developed by Yokee Music for iPhone. It’s available for free and has been recently updated to fit ios 12. 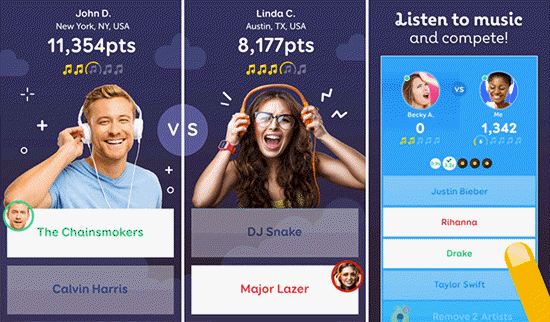 Yokee allows its users to experience traditional karaoke singing through their iPhone. You can easily search for a karaoke track and then sing it on this app. With over 90 million users, Yokee promises to be the best karaoke singing app for advanced or beginner singers. Yokee also allows you to share your saved tracks with your friends on social media. This way, you can update your friends on what you have been singing and check out their recent tracks as well. Perfect understanding of pitch, rhythm and much-needed control of voice are what separates great singers from the ordinary ones. 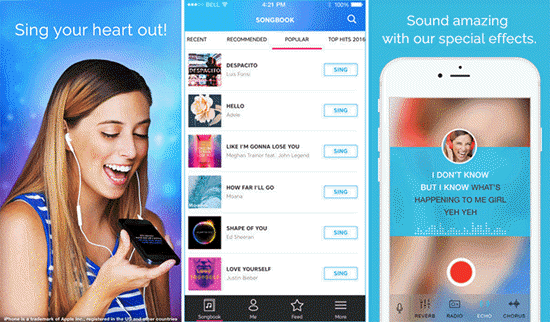 Voloco is a real time karaoke app that processes your voice and auto tunes it. It also shifts the pitch and adds an additional flair known as vocoding. You can pick any song from your library to sing and voloco will automatically recognize the song and will set its pitch according to your voice. Voloco offers monthy and yearly subscription options, with a 7 day trial for users to fully experience the app before purchasing it. 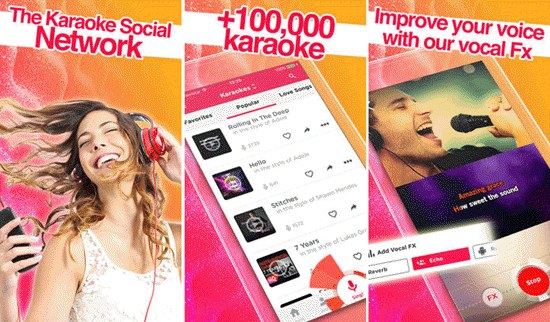 The Starmaker app is another popular Karaoke app on the App Store with over 50 million users. It is regularly updated with trending music and has an online global community for singers. It allows you to sing tracks of the best singers in the industry including Bruno Mars, Miley Cyrus or John Legend. Just like Yokee, Starmaker also allows you to share your saved tracks on social media. You can share your videos, images or tracks on your newsfeeds as well as in private messages. A great feature which makes Starmaker stand out is live streaming. With live streaming you can organize a mini concert for people who follow you and you can view live streaming of the ones you follow. In-app VIP subscription allows users unlimited access to new, weekly releases and also unlocks a song catalogue which is not available on the free version. Possessing a rather huge collection of more than 100,000 karaoke songs, “Red Karaoke” provides an endless option to enhance and polish your singing skills on iPhone. You can record the audio or video while improvising, and share it on social media. The users can add themes while balancing the music with their voice. Red Karaoke app allows you to connect with your television and throw a karaoke party on your tv. SongPop 2 is one of the most popular singing apps on iPhone when it comes to music communities around the world. It possess over 100,000 music clips from the biggest artists in the showbiz. 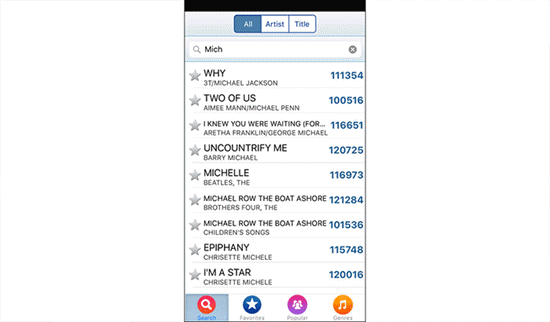 Users can search and find the tracks of their favorite artists and sing along with them. New music is added everyday as well as new challenges to earn points or trophies. There is a party mode where you compete against other players around the world in form of tournaments. This way you can test your skills and check how much you have improved. If you have what it takes, you earn new trophies and rewards after every victory. SingSnap claims at possessing more free karaoke tracks in comparison to other competitors of paid apps. This claim stands strong. This app features perks such as audio enhancements and to bring out the best creative sides in the users. 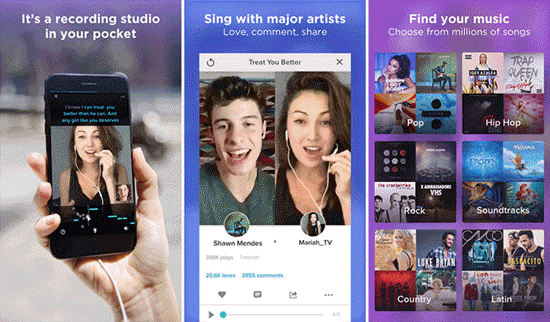 Singsnaps allows users to share their tracks on social media like majority of the music apps. It is a free-to-use app, however, with a monthly subscription, users can get access to all of the tracks and features of the app. If you feel as though you don’t have the gifted voice to be a star singer? This amazing singing app not only eliminates fear from your heart but also assists you in improving your sound quality. 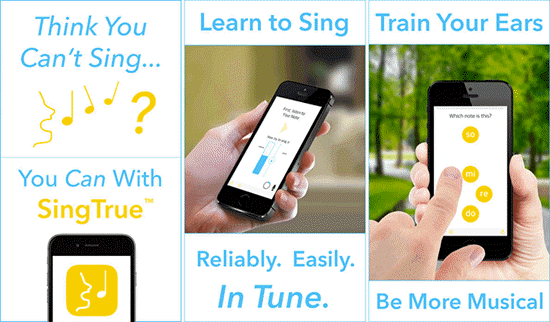 Rated as easy-to-use and a perfect app for new singers by one of the most trusted sites, Singtrue promises that it will enhance your skills as a singer and will eliminate the fear of bad voice in your heart. Singtrue has also been selected by Apple on iTunes as “Learn an instrument” feature for iPhone or iPad users. This app claims that everyone can sing and there is not such thing as a natural talent of singing. 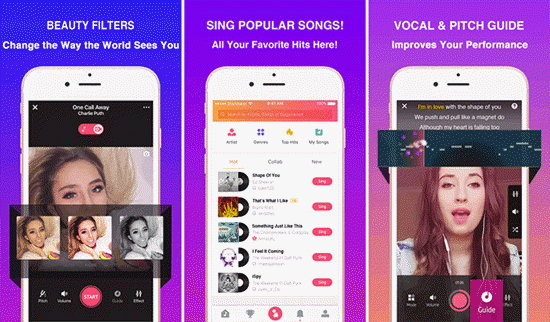 It promises users to be better singers after some time of using the app. All it demands from users is to stay consistent and confident. It offers over 30 different exercises to improve your vocal skills and also provides a personal feedback of your voice by recording it through your microphone. It allows you to track your details in progress and record any improvements. Its In-app purchase feature unlocks the full set of exercises which users can benefit from and take their singing skills to a whole new level. Tracks inside the KJ Touch R app are updated on weekly and monthly basis. This shows that the developers show concern to their app and as well as their audience. The popular charts are also regularly updated so that users can access the trending tracks. The app is under 10mbs in size, therefore, it can be downloaded even your iPhone is low in storage. Singing is always considered to be a natural talent and many people leave their ambition for singing just because they feel untalented. However, these apps not only provide entertainment to lighten up people’s free times, but also help boost confidence of people. These karaoke applications really make lives of such people better as they help them to chase their dreams. If you enjoy using any of them, feel free to share your happy singing experience with us, or you can comment down any question you have.